Oh, wow, I loved this! A last-minute selection at the library could now possibly be one of my favourite books. There are so many clever literary references and beautifully written thought processes in this short but weighty novel from 2006. 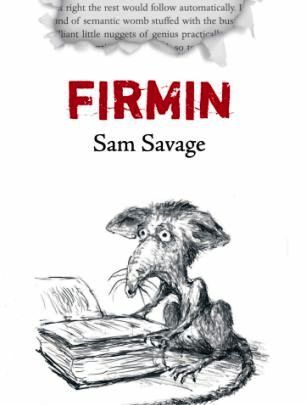 The author, Sam Savage, has done a brilliant job relaying the angst felt by a ‘lowlife’ rat in his quest to be accepted and understood. We’ve all been through something like that at some stage, right? Firmin, the runt, is born to a mother of dubious social standing and battles his 12 brutish siblings before going it alone. Staying in the book store where he was born has considerable benefits, because Firmin can read. He devours the shop’s contents (initially literally, then figuratively) to be a well-read rat of note, and would dearly love to have an educated conversation with the shop’s owner, Norman, or a one-on-one encounter with an actress from the nearby movie theatre, where he goes on his nightly food run. But without the ability to speak, write, type or even do sign language, he relies on his imagination. I don’t want to write too much, because this was such a lovely surprise for me, that I’d love for it to be a surprise for you too. It might make you look at a rat differently on your next encounter. I want to say “I guarantee it will make you …” but some people could never be swayed in their hatred for vermin! ← May 5: Oops but for a good reason! Ahahahaha! Yes Firmin is one very clever rat. Maybe yours could become Firmins if you fed them books instead of real food?! Thanks for stopping by Zoe. I hope you have a chance to read it.